How to Copy Start menu Layout from one Windows 10 PC to Another? 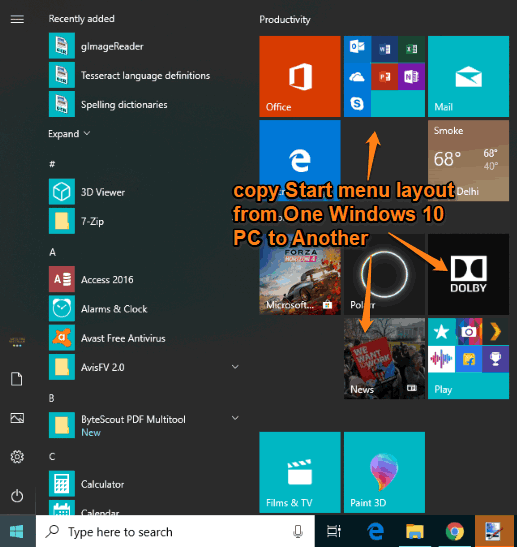 This article covers how to copy Start menu layout from one Windows 10 PC to another. 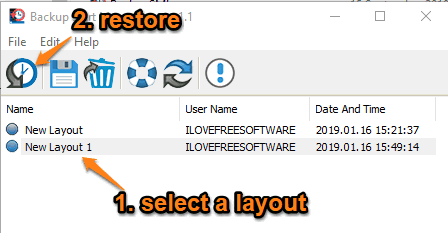 That simply means you can take backup of all the tiles (apps pinned to your Start menu) along with their positions of one Windows 10 PC and then restore those tiles to another Windows 10 PC as it is. Every tile will be in its own place. You will be able to create multiple copies of Start menu layout and then choose any layout of your choice to apply on another PC. To copy Start menu layout from one to another Windows 10 PC, you can use a free software called “Backup Start menu Layout“. From creating a copy of Start menu layout and pasting that copied layout to another Windows 10 PC is pretty easy. Do note that you must have installed all those apps on another PC which are available in the first PC. Otherwise, Start menu layout won’t be copied to another PC. Step 1: Download the zip file of this software and then extract it in a folder. Its zip file can be downloaded using the link given at the end of this tutorial. Step 2: Execute its 64-bit or 32-bit version application file and its interface will be in front of you. Step 3: On its interface, use the Create backup button or File menu. It will immediately create the backup file of all the tiles and their positions. The backup file is automatically stored in the extracted folder (that you extracted in step 1) under MenuLayouts folder. Step 4: Now copy the extracted folder and paste it in some pen drive. Step 5: On the second PC, paste that folder, and open it. Now again execute the application file of this software to open its interface. You will notice that the same Start menu layout backup file is visible there. Select that file and use Restore icon. It will immediately change the current layout and set the Start menu layout of the first Windows 10 PC. Did you know you can also change the tile color in Windows 10? This is an easier way to copy Start menu layout from one Windows 10 PC to another. It is gonna come in handy when you want to keep your home and Office Start menu layouts same or you have formatted your Windows 10 PC and want to have the same Start menu layout. Just create the backup of Start menu layout in just one click and restore it in one click. The best part is you can create multiple backups and restore them.